Simply line up the hinge over the boring holes. 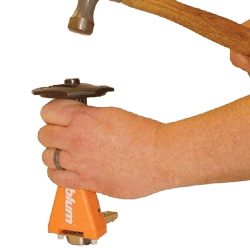 Then, using a rubber or wooden mallet with the Blum "Knock In" tool, knock the hinge to place. The older style knock-in tool is not appropriate for the Blumotion hinges due to the Blumotion device being in the cup of the hinge.